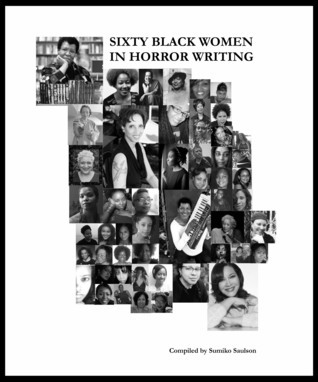 This book is a compilation of interviews, essays and biographies of Black Women horror writers. Some of the writers featured in this book include Octavia Butler, L.A. Banks, Tananarive Due and many more.I feel this is an important book because it gives writers exposure. Writers have to work hard at their craft and its hard for them to get the attention they deserve. There are more writers out there than readers and it's too easy for a good writer to go unnoticed. 60 Black Women in Horror Fiction shows that there are some great Black women horror writers out there. I only knew a handful of the writers in this book and after the in-depth interviews and short stories collected here, I found some new writers that I need to add to my to be read list.This book starts with biographies and pictures of several writers and then gets into interviews with Linda Addison, Jemiah Jefferson and Eden Royce to name a few. One of my favorites parts of this book was how some of the writers talk about how women horror writers get treated differently than their male counterparts and there aren't as many. In the case of A.L. Peck she states that she doesn't know why there aren't more female horror writers and she wants to change that.There is also a great interview with Jemiah Jefferson where she talks about the hardships of finishing a novel while putting up with health issues, a stressful job and financial issues. This book doesn't just give you a new perspective on what Black Women horror writers have to go through to get their work out to the public, it gives you a new appreciation for writers in general. 60 Black Women in Horror Fiction shows you what Black Women horror writers have to offer and gives a glimpse of what goes on in the mind of a horror writer. The section up front is a great resource. Several names are familiar, but more from Science Fiction and Fantasy than from Horror. I will be returning to this resource. But the big reason I picked this up was the short fiction.“Amber’s New Friend” by Crystal Connor is a haunting story that mostly adheres to the Jamesian guidelines. To frame this discussion, it is worth bringing in words from the Dean of the School of Ghost Stories, M. R. James. “Two ingredients most valuable in the concocting of a ghost story are, to me, the atmosphere and the nicely managed crescendo. I assume, of course, that the writer will have got his central idea before he undertakes the story at all. Let us, then, be introduced to the actors in a placid way; let us see them going about their ordinary business, undisturbed by forebodings, pleased with their surroundings; and into this calm environment let the ominous thing put out its head, unobtrusively at first, and then more insistently, until it holds the stage. It is not amiss sometimes to leave a loophole for a natural explanation; but, I would say, let the loophoole be so narrow as not to be quite practicable.”“Another requisite, in my opinion, is that the ghost should be malevolent or odious: amiable and helpful apparitions are all very well in fairy tales or in local legends, but I have no use for them in a fictitious ghost story.”I was too distracted by the ghost being a central character and omnipresent for the atmosphere to work, and it was there full time throughout the story. I would have enjoyed more growing tension. The epilogue raised more questions for me than it answered.“The Last” by Sumiko Saulson starts right where Frankenstein ended. Unfortunately, I didn’t really care for Frankenstein, so this story was doomed to not work for me. “Rhythm” by Eden Royce is beautiful and lyrical in its unrelenting anger. “The Funeral” by Annie J. Penn was a bit too surreal complicated by what appeared to be format issues. These worked against being able to immerse myself in the story. This is a book that was waiting to happen to the literary world and, really, beyond. There's nothing else in print that addresses these authors who have received far too little exposure and attention. I love this author's writing and she is my favorite black woman in horror! I feel this is an important work. It's a list of biographies and interviews with black women who write horror. I won't give it a star rating since I'm the person who wrote the biographies and interviewed the other writers. Most of the stories were mediocre; only one really caught my attention and I really like it, so overall the book was just likeable but nothing more. Sumiko Saulson Crystal Connor Annie J. Penn Eden Royce David Watson - Sumiko Saulson is a science-fiction, fantasy and horror writer and graphic novelist. She was the 2016 recipient of the Horror Writer Association's Scholarship from Hell. Her works include the reference guide 60 Black Women in Horror Fiction, novels include Solitude, The Moon Cried Blood, Happiness and Other Diseases, Somnalia, Insatiable and the bestselling horror comedy Warmth. She has written short stories for anthologies including Forever Vacancy, Babes and Beasts, Tales from the Lake 3, Clockwork Wonderland, and Carry the Light 5 where she won second place for the science-fiction short story "Agrippa." She’s the editor of the anthology Black Magic Women. She writes for Search Magazine, and SumikoSaulson. The child of African American and Russian-Jewish American parents, she is a native Californian who grew up in Los Angeles and Hawaii. She is an Oakland resident who has spent most of her adult life in the San Francisco Bay Area.